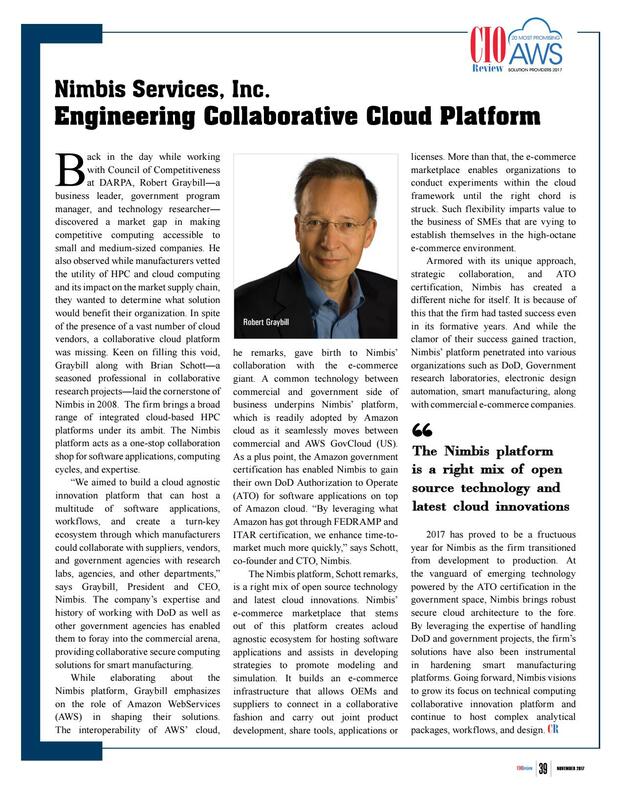 Check out the latest edition of CIO Review which highlights Bob Graybill & Brian Schott of Nimbis Services, Inc. featured as one of the 20 Most Promising AWS Solution Providers 2017. Back in the day while working with Council of Competitiveness at DARPA, Robert Graybill--a business leader, government program manager, and technology researcher--discovered a market gap in making competitive computing accessible to small and medium-sized companies. He also observed while manufacturing vetted the utility of HPC and cloud computing and its impact on market supply chain, they wanted to determine what solution would benefit their organization. In spite of the presence of a vast number of cloud vendors, a collaborative cloud platform was missing. Keen on filling this void, Graybill along with Brian Schott--a seasoned professional in collaborative research projects--laid the cornerstone of Nimbis in 2008. The firm brings a broad range of integrated cloud-based HPC platforms under its ambit. The Nimbis platform acts as a one-stop collaboration shop for software applications, computing cycles, and expertise. READ FULL ARTICLE HERE.